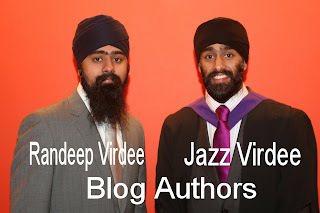 JAZZY V & RANDEEP V: The Three Bloggers! i would just like to promote some of our friends blog sites. first one is preeti's blog. she has dedicated her blog to her father, satinder singh. she updates her blog often and its good and funny. 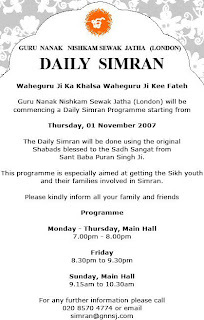 Below is a video of her doing some naam simran. 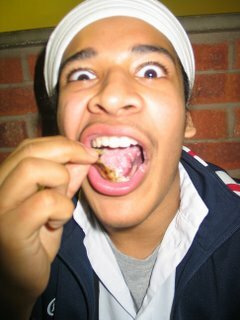 The pic of the joker below is mr jaat lee singh. His blog is also updated often. As you can tell from the pic hes a complete nutter, and if you see him anywhere, stay away from him, dont make any eye contact and call the punjabi police! hehe. Below is himmat singh. If only he owned that car hehe. this guy is currently "Available" through the website ebay. 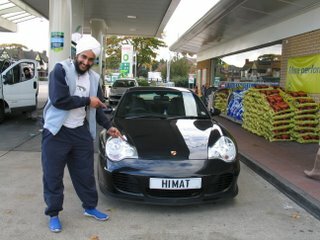 hehe so if you have a gursikh daughter/sister/friend whos in need of a himmat singh, you can get him on ebay! hehe. hes a very naughty blogger who never updates! himmat you need to update your blog! Happy Birthday Bhai Chamandeep Singh Ji!